Welcome to North Bruce Peninsula! The Municipality of Northern Bruce Peninsula is the Northerly Neighbouring Community to the Town of South Bruce Peninsula, the home of Wiarton Willie. The Bruce Peninsula itself is Surrounded on the East by Georgian Bay & on the West by Lake Huron. It encompasses the former Townships of Eastnor, Lindsay & St. Edmunds, and the Stunning Village of Lion's Head. Many other Hamlets within North Bruce Peninsula Include: Tobermory, Stokes Bay, Pike Bay, Miller Lake, Barrow Bay, Ferndale, & Dyers Bay...Just to Name a Few! 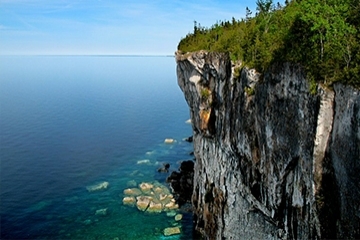 Northern Bruce Peninsula is Home to the Fathom Five National Marine Park, the Bruce Peninsula National Park, St. Edmund’s Township Museum, Five Picture-Worthy Lighthouses, the Bruce Trail, Cabot Head & Lion's Head Nature Reserves, Two First Nations Hunting Reserves and a Large Bruce County Forest Tract. Tobermory is the Jewel at the Tip of the Bruce Peninsula. Tobermory Means so Much to so Many. Naturalists, Photographers, Hikers, Cyclists, Campers, Boaters, Divers---they all Simply Call it Paradise! It is also Home to the Chi Cheemaun & is the Southern Terminal to Manitoulin Island. So Many Wonderful Opportunies & Adventures Will Unfold on Your Visit to Tobermory, Whether it be the Great Eateries, Comfortable Accommodations, Outdoor & Underwater Life Sight-seeing, Strolling the Boardwalk or Just Relaxing---there’s ALWAYS Something for You & Your Family in the North! Northern Bruce Peninsula has a Wide Array of Real Estate for Sale, ranging from: Classic Three Season Cottages, to Vast Farm Acreage, Million Dollar Brand New Waterfront Dream Homes & Cottages, to Modest Family Homes. Understanding the Local Market Conditions of Northern Bruce Peninsula & All of the Fantastic Things it has to Offer is Important When it Comes to Buying & Selling Real Estate. When it's Time to Buy or Sell Your Dream Home or Cottage, Call Our Team! Get an Agency on Your Side Who Has Experience with the Local Northern Bruce Peninsula Market. Reach Out to Us Today so We Can Introduce You & Your Family to all that Northern Bruce Peninsula has to Offer!